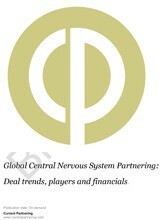 The Global Central Nervous System Partnering 2014 to 2019: Deal trends, players and financials report provides comprehensive understanding and unprecedented access to the central nervous system (cns) partnering deals and agreements entered into by the worlds leading healthcare companies. Global Central Nervous System Partnering 2014 to 2019 provides the full collection of Central Nervous System disease deals signed between the world’s pharmaceutical and biotechnology companies since 2014. The report takes readers through the comprehensive Central Nervous System disease deal trends, key players and top deal values allowing the understanding of how, why and under what terms companies are currently entering Central Nervous System deals. The report presents financial deal terms values for Central Nervous System deals, where available listing by overall headline values, upfront payments, milestones and royalties enabling readers to analyse and benchmark the value of current deals. The initial chapters of this report provide an orientation of Central Nervous System dealmaking trends. Chapter 2 provides an overview of the trends in Central Nervous System dealmaking since 2014 covering trends by year, deal type, stage of development, technology type and therapeutic indication. Chapter 4 provides a review of the leading Central Nervous System deals since 2014. Deals are listed by headline value. The chapter includes the top 25 most active Central Nervous System dealmakers, together with a full listing of deals to which they are a party. Where the deal has an agreement contract published at the SEC a link provides online access to the contract. Chapter 5 provides comprehensive access to Central Nervous System deals since 2014 where a deal contract is available, providing the user with direct access to contracts as filed with the SEC regulatory authorities. Each deal title links via Weblink to an online version of the deal record contract document, providing easy access to each contract document on demand. Chapter 6 provides a comprehensive directory of all Central Nervous System partnering deals by specific Central Nervous System target announced since 2014. The chapter is organized by specific Central Nervous System therapeutic target. Each deal title links via Weblink to an online version of the deal record and where available, the contract document, providing easy access to each contract document on demand. In addition, a comprehensive appendix is provided with each report of all Central Nervous System partnering deals signed and announced since 2014. The appendices are organized by company A-Z, stage of development at signing, deal type (collaborative R&D, co-promotion, licensing etc) and technology type. Each deal title links via Weblink to an online version of the deal record and where available, the contract document, providing easy access to each contract document on demand. The report also includes numerous tables and figures that illustrate the trends and activities in Central Nervous System partnering and dealmaking since 2014. In conclusion, this report provides everything a prospective dealmaker needs to know about partnering in the research, development and commercialization of Central Nervous System technologies and products. Global Central Nervous System Partnering 2014 to 2019 is intended to provide the reader with an in-depth understanding and access to Central Nervous System trends and structure of deals entered into by leading companies worldwide. The report includes deals for the following indications: Cerebral palsy, Creutzfeldt Jakob disease, Dizziness, Epilepsy, Faints, Falls, Guillain Barre syndrome, Headache, Meningitis (Bacterial, Meningococcal, Pneumococcal), Mycobacterium tuberculosis (TB), Haemophilus influenzae Type B (Hib), Migraine, Motor Neurone Disease (Amyotrophic Lateral Sclerosis/Lou Gehrig's Disease, Multiple sclerosis, Nausea, Neuropathy, Pain, Neuralgia, Fibromyalgia, Paralysis, Parkinson's disease, Restless leg syndrome, Spinal cord, Stroke, Stuttering, Traumatic Brain Injury, Vertigo, Weakness, plus other CNS indications.